Back in early March, we wrote about how this year’s cherry blossom peak was predicted to occur a bit later than in 2012—March 26-30 instead of March 20-23. While recognizing that later peak blooms in a single year don’t prove anything either way about global warming, we still raised the question of press reaction—or rather the lack of it. Since the early peak dates in the last three years caused quite a bit of climate alarmism, the same should, theoretically, happen when the peak date is overdue. And in another piece that he wrote on cherry blossoms this Monday, Samenow didn’t mention his 2012 predictions either. In the most recent piece, he did call the weather “unseasonably chilly”; I wonder if zipping up his jacket made him forget about his past articles. 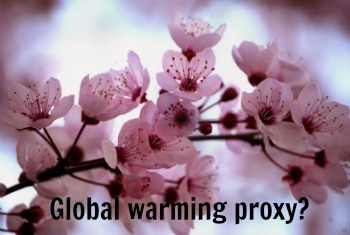 This year’s cold March, and the later peak bloom prediction, doesn’t necessarily mean that Samenow should now warn readers about global cooling. But shouldn’t he at least admit to readers that this season is running counter to his predictions? After all, that is the cold (or at least unseasonably chilly) truth.